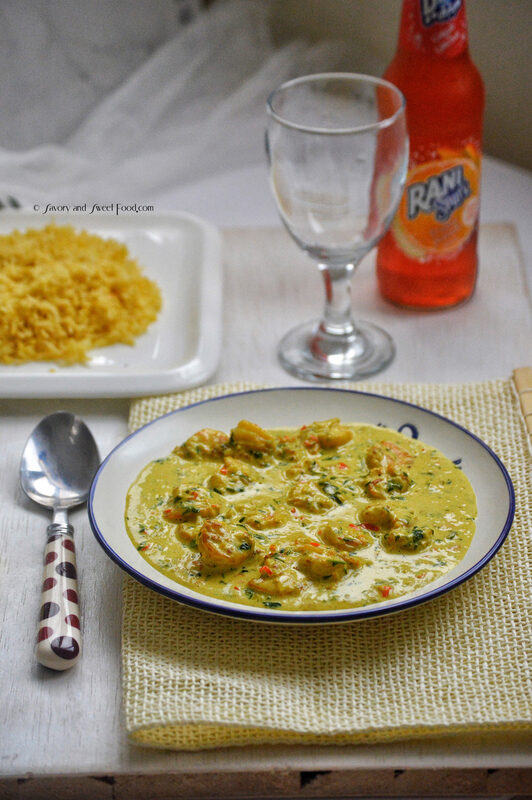 Pan seared prawns smothered in flavorful homemade cream sauce. This can be your easiest weeknight meal, which goes well with a nice hot bowl of rice, bread or pasta. This is not a curry, but it does serve the purpose of a curry. 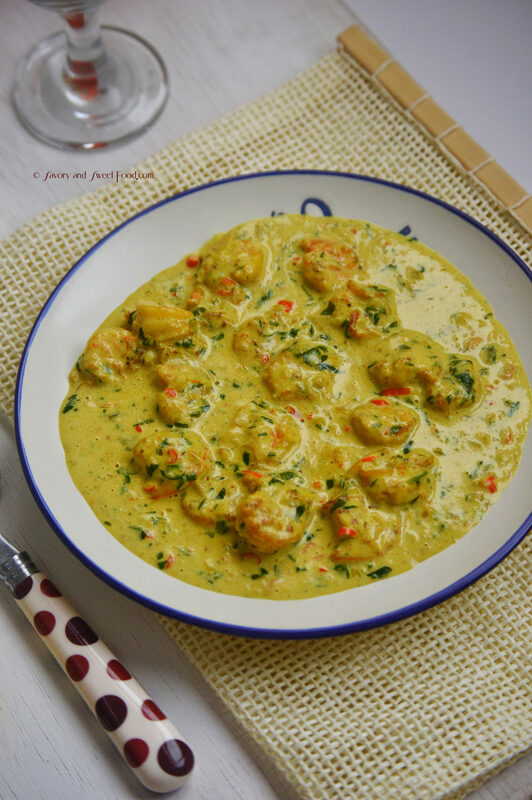 But in this recipe I did not use any sort of Indian masalas, but even then this Garlic Prawns In Cream Sauce boasts of so much amazing flavor that I thought it would be a sin if I didn’t share this recipe with you all. The base of the sauce here is butter, chicken stock and cream. Its so awesome that such simple ingredients can make a dish so flavorsome. I was in a hurry the day I made this dish, so I kept it simple. But you easily add in spinach, corn, broccoli and also sun dried tomatoes. But if you want to keep it plain like mine, that’s completely fine too. It will taste just as good. I served this with some pumpkin rice. 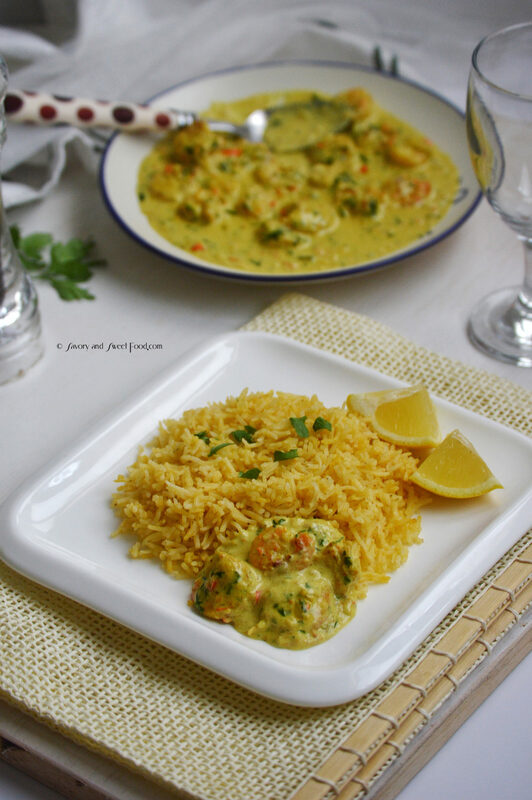 Plain rice would go well too, as this dish by itself is packed with strong flavors. 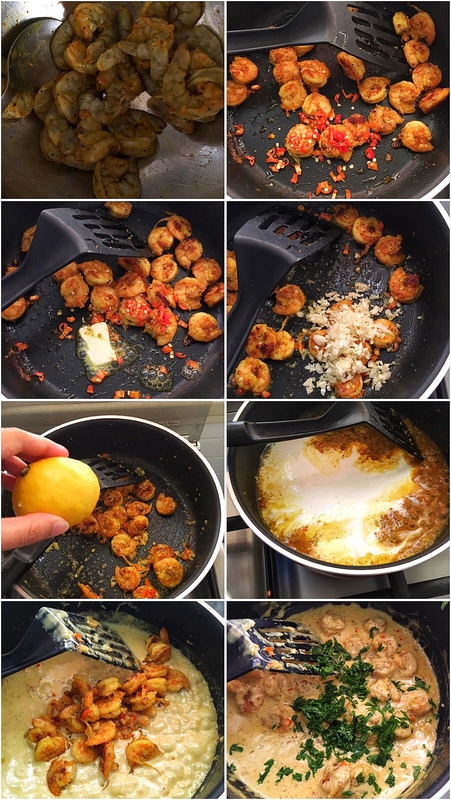 You can serve it with plain pasta, or just use this as a pasta sauce. If you want more gravy, pour more cream. But make sure that the gravy/sauce is thick. 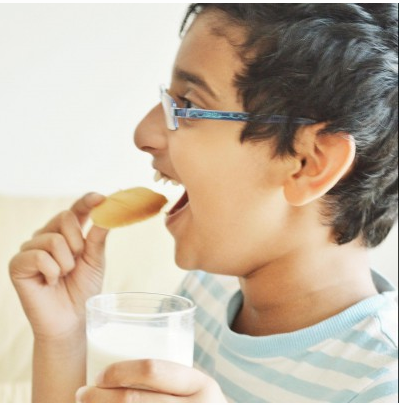 At the time of serving, if the sauce turns out to be too thick, pour in a splash of milk or cream. Freshly cracked pepper is preferred. If you want it less spicy, just add one red chilli. Be very careful with salt, because if you are using store bought stock broth or stock cube, it will have salt in it. So you would need only a pinch of salt in the prawn marinade. Adjust salt in the end after pouring the stock. Marinate the prawns in turmeric powder, pepper and salt. In a pan, pour olive oil. Drop in the prawns and sear the prawns. Add in chopped chilli. Stir around for a minute. Add in butter and the garlic. Sauté for a minute. Fish out the prawns and keep it aside. Pour in the stock. Boil till it gets reduced. Pour cream. Let the gravy become thick on medium flame. Put the prawns back in. Add freshly cracked black pepper and salt to taste. Add chopped parsley. Serve hot along side plain rice. I served it with pumpkin rice. If you want it less spicy, just add one red chili. This looks divine and I am sure it will taste divine as well ! Definitely going to make this. Can you please post recipe of your pumkin rice? 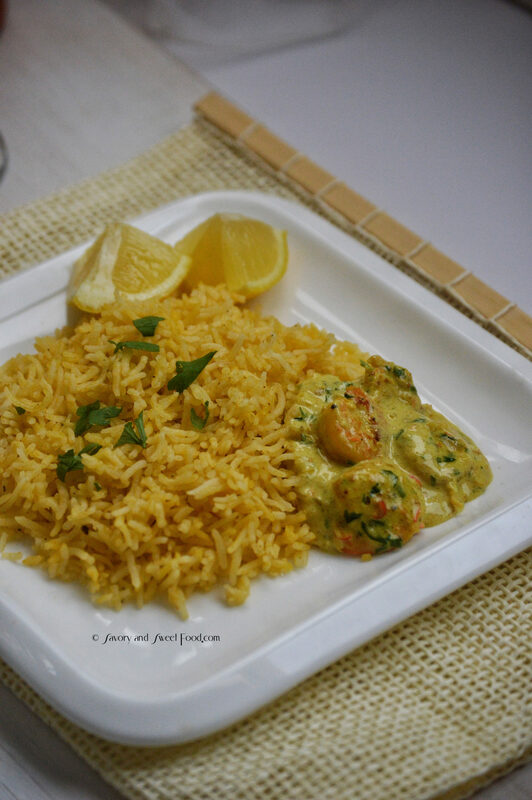 Yes, in shaa Allah I will include the rice recipe in the same post soon. Can we make the same with chicken? ?